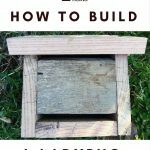 We built mason bee houses to attract pollinators for our fruit trees. Now, that that’s worked, we’re working to attract more beneficial bugs to help with the pest control. Since this is the first year that our apricot bushes have fruited, making sure they’re well protected is top priority. I did some research to figure out which pests we were likely to be up against, and learned that aphids are one of the biggest threats. 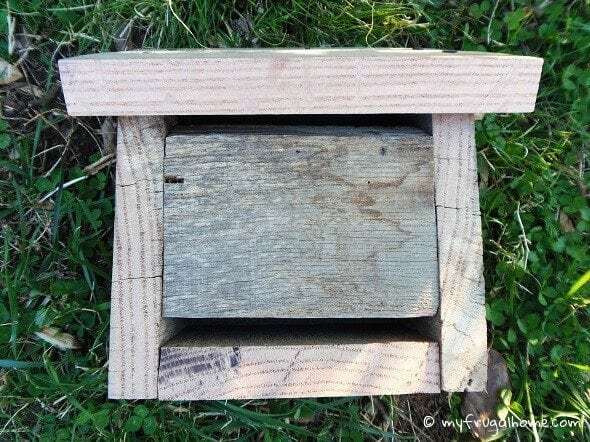 Knowing that ladybugs have a voracious appetite for aphids, I decided it was time for us to finally build that ladybug house that’s been sitting on my to-do list for ages. We already have a good ladybug population in our yard, but by building them a house, we hope to encourage them to overwinter in our yard, so they’ll be ready to go to work for us as soon as the warm weather arrives each spring. 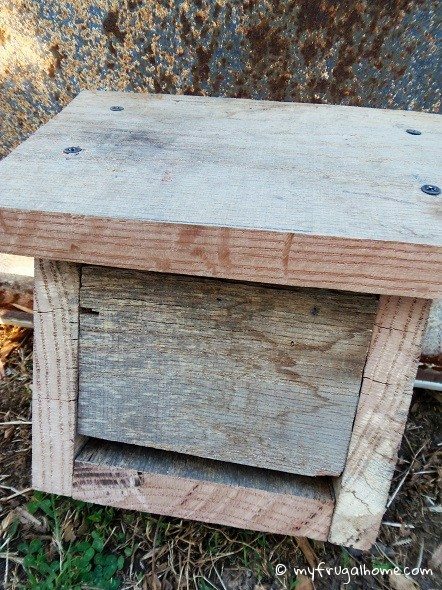 And since we’ll be placing our new ladybug house next to our apricot bushes, that should mean our bushes will be well protected from aphids all season long. Ladybugs also eat mites, white flies and scale, so we may just have to build another one for our vegetable garden. 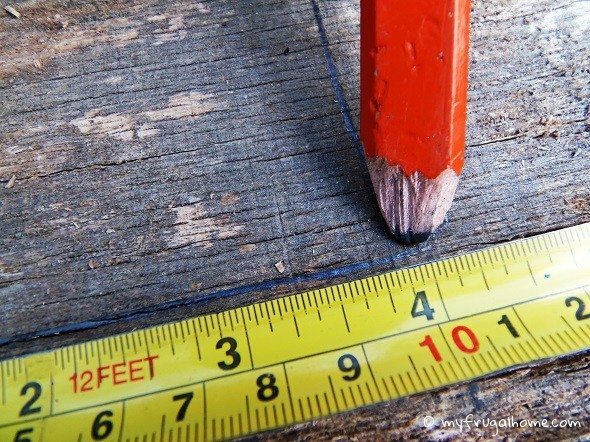 Measure a piece of wood to 7-15/16″ high x 3-15/16″ wide. 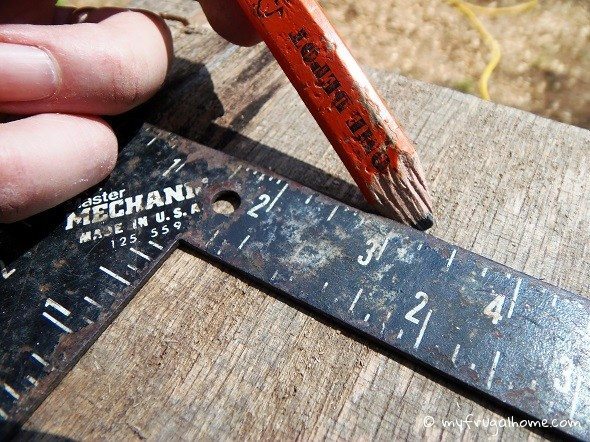 Then measure down 2-13/16″ from the top of one of the 7-15/16-inch sides, and make a mark. 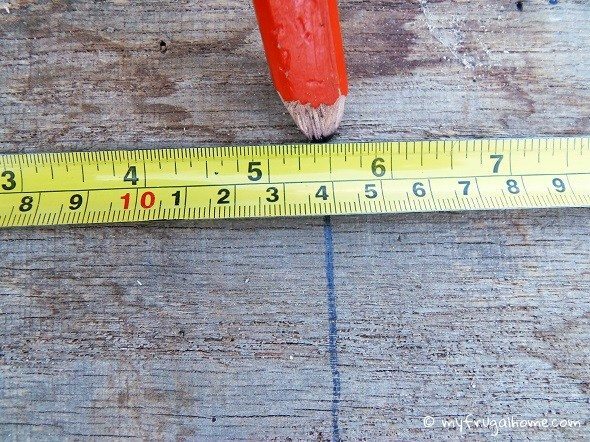 Draw a sloping line up from this mark to the top corner of the opposite 7-15/16-inch side. 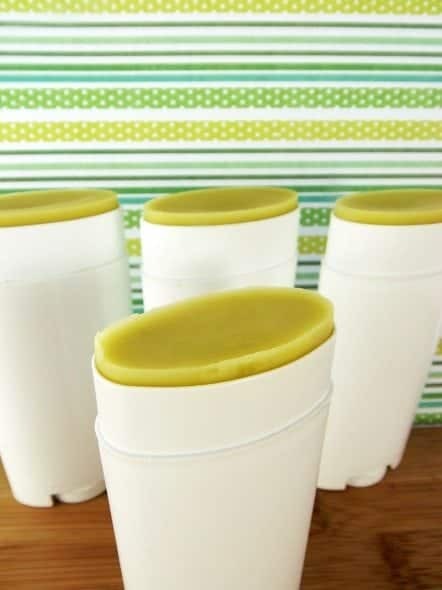 You will end up with a line that slopes at 30 degrees – the slope of the roof. Cut along the sloping line, and repeat the process for the second side panel. 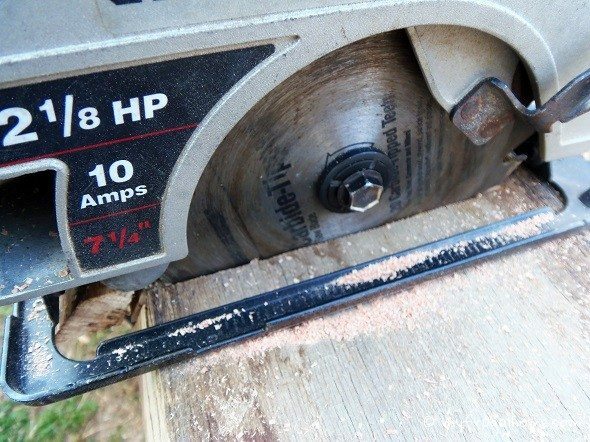 Measure and cut a piece of wood to 5-1/2″ x 7-15/16″. Bevel one of the 5-1/2-inch sides at 30 degrees to accommodate the sloping roof. 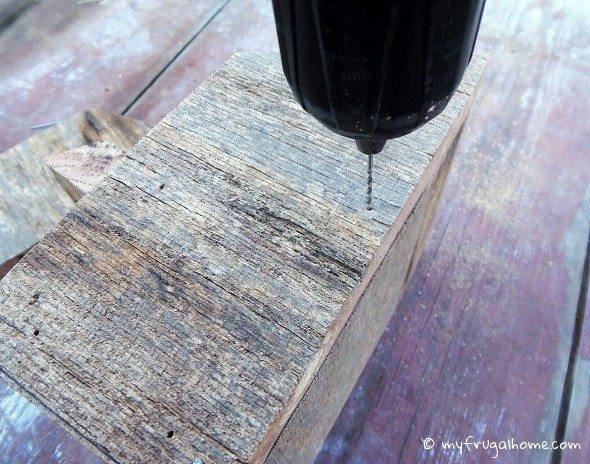 Measure and cut a piece of wood to 4-1/4″ x 5-1/2″. Bevel one of the 4-1/4-inch sides at 30 degrees to match the slope of the roof panel. 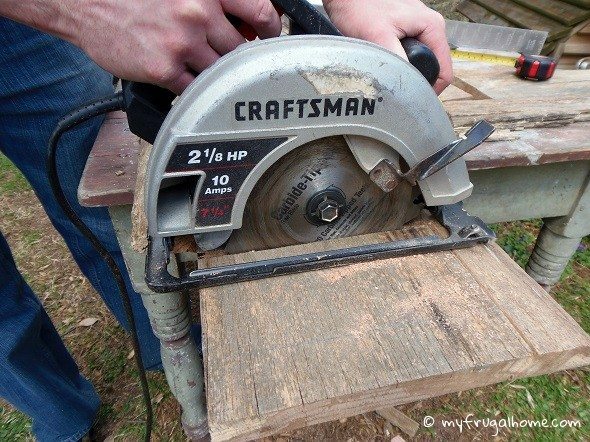 Measure and cut a piece of wood to 5-3/4″ x 9″. Bevel the back edge (one of the nine-inch sides) at 30 degrees. Here are all of the pieces that you should now have. Lay everything out, and test the fit before proceeding. 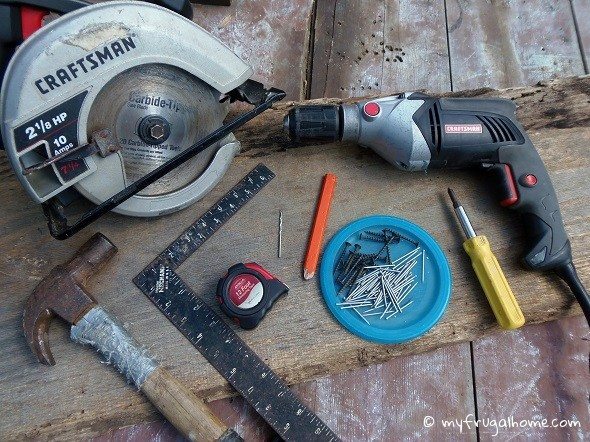 Nail the side panels to the back panel with six nails – three per side. 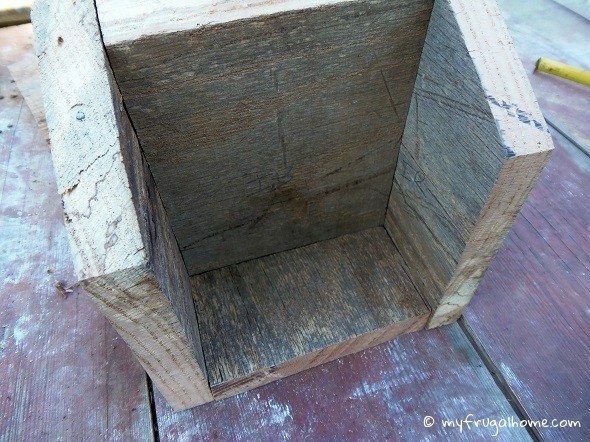 Pre-drill these holes and all the holes in the next steps to avoid splitting. 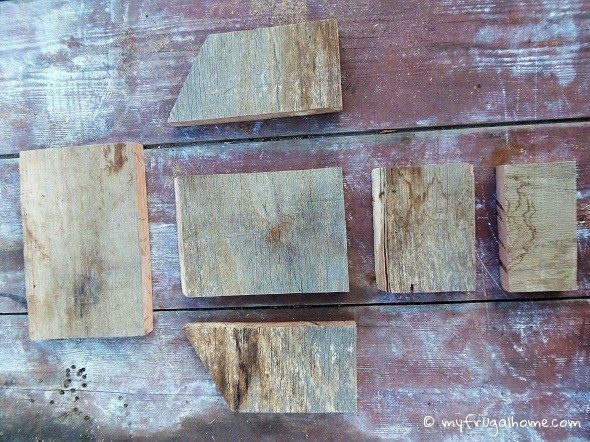 Nail the bottom panel to the side panels with four nails – two per side. Center the front panel in the opening, and attach with two nails per side. 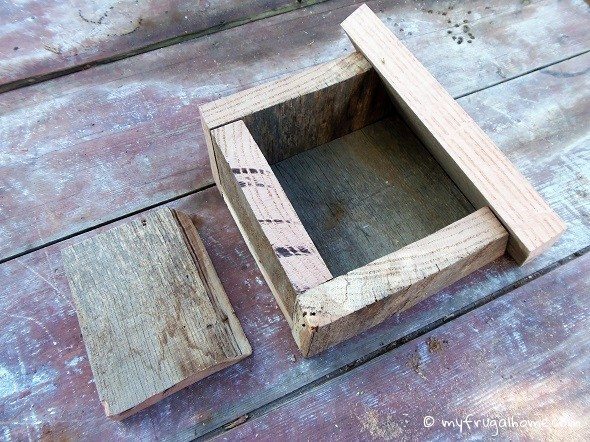 This will create a gap at the top and bottom of the house, to serve as the entrances and ventilation. Attach the roof panel with four screws, so that the roof can be removed for seasonal cleaning. 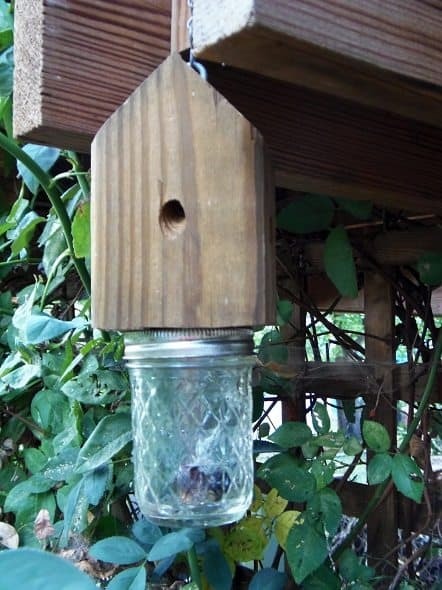 Then, hang your ladybug house in your garden, and wait for ladybugs to move in next fall. Just be careful not to add it too close to your house. We have a house that has full sun on the front and we fight all winter lady bugs in the house because they have created an annual nesting in our walls each fall. They get so thick some years, you can’t even see the walls on the front of the house. I love ladybugs but I don’t love them in my house. They emit a smell especially when bothered. We vacuum them up by the 100’s every few hours during the worst part of the time. Yep, there were ladybugs in the attic when we bought our house. Like you said, they look for warm places to nest in the winter, and if you have any cracks in the exterior of your home, they’ll find them. We sealed up the spot where they were getting in, and we haven’t had any since. To encourage our ladybugs to stay close to our rose bushes, we built a ladybug house for them. It’s our hope that they’ll choose to overwinter there. did you guys find that they wintered in the houses and came back year to year? You Know what? YOur question made me realize we’d somehow neglected to hang our ladybug house after we built it. Total fail on our part. Once I figure out what happened to it, I’ll be hanging it. But I’m afraid that means I don’t currently have an answer to your question. I was curious. This looks like a house that wasps would just love to find. 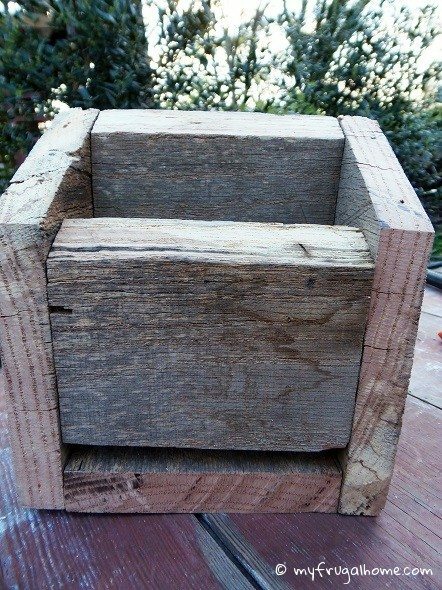 Has anyone had any problems with wasps building their nest in one of these or does one do something to keep them out of it? I got enough wasps already. I don’t want to build them a house but I do like the lady bugs.